Celebrities, they're just like us. They spend hours agonizing over outfits they'll only wear once, scroll their address books incessantly to find the perfect date, and plaster their glamorous selfies all over social media. 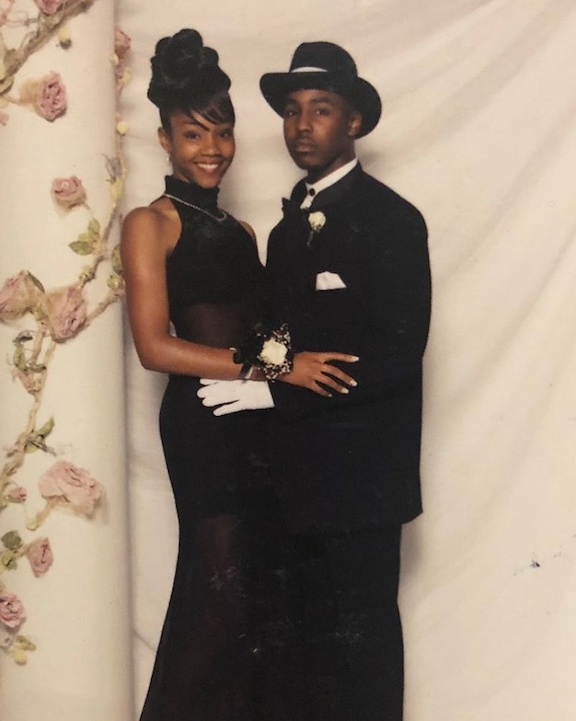 From Tiffany Haddish to Lance Bass, here are 11 celebrity prom photos that are so adolescently awk, they're totally gold. Way before she became a comedian and got dragged by the internet for a terrible New Year's standup set, Tiffany Haddish was a total babe who attended not one, but three separate proms. “The first prom I went to was with a dude I’d never met before. 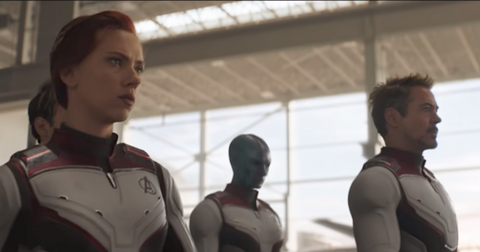 It was my home girl, she was like, ‘Hey, my friend, he kind of wants to go to prom, but he’s kind of big,'” she said in an interview with People. “He had his whole family come to pick me up in a limo and everybody was like, ‘Oh my God, oh my God, you got a pretty girl! You’re going to prom with a pretty girl! '” she continued. The pic above was from a different prom, one she attended with someone she actually knew quite well. "This dudes name is Jason he was one of my best friends back then," she captioned her Instagram photo. 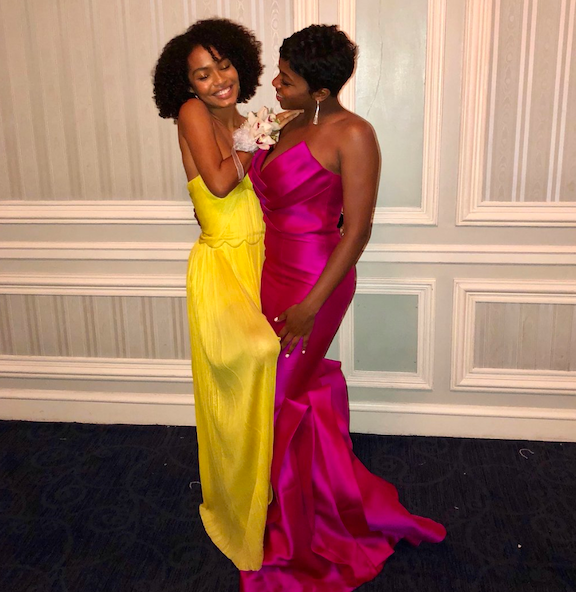 Blackish and Grownish star Yara Shahidi rocked a gorgeous yellow dress that had her channeling Beauty and the Beast's Belle. She took her "wondertwin" and "siblicousin" Camryn Salter, a stellar young tennis champion in her own right, who wore a stylish structured fuchsia dress. But this isn't the only prom the 18-year-old has attended. She also went with Girl Meets World star Rowan Blanchard, and donned a classy, flowy green frock. 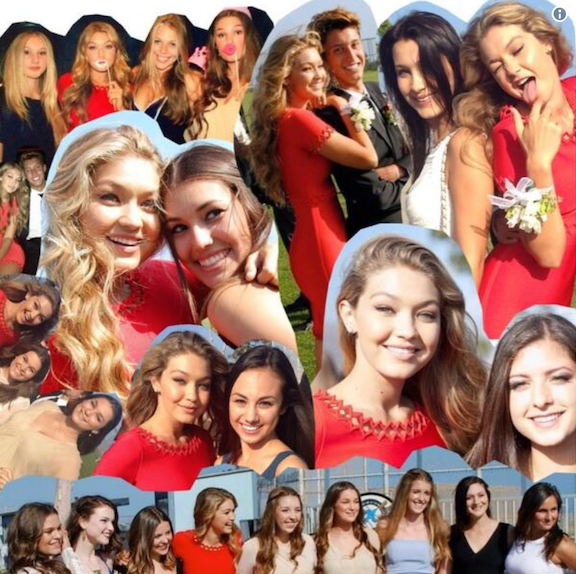 In 2013, Gigi Hadid went to her prom in a red Hervé Leger dress that had the whole internet swooning. It was a great way to end a streak of four years attending prom, though she admitted in an interview with Blake Lively that she had never once "bought a prom dress." This gorgeous red she wore to her last prom in Malibu came straight out of her mom's closet, the model revealed. "In Malibu, we wore short dresses to prom because it's a beach town. The gown situation wasn't really our thing," she added, per PopSugar. Before becoming a world-renowned name and headlining the biggest tour in America, Taylor Swift was just as awkward as you. The proof is in this photo, where she's wearing a gorgeous cream dress and looks somehow shocked at the camera while modeling a gang sign. No word on her backward-baseball-cap date, but I can't help but wonder if she's worked him into one of her songs. 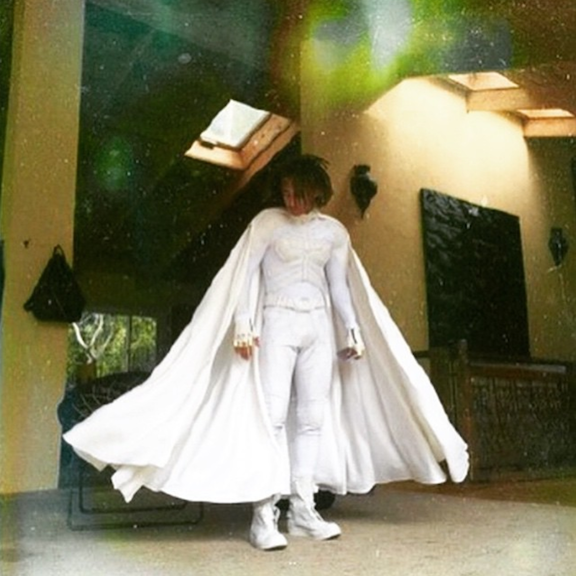 It should come as a surprise to no one that Jaden Smith rocked this white Batman costume when he attended one of at least three proms he was invited to, but the outfit made waves back in 2015 when the then-16-year-old wore it. And even though he's a seasoned prom alum, Jaden says the school event stresses him out much more than even the Met gala. 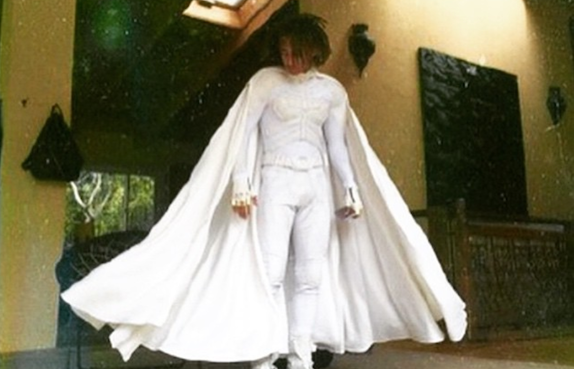 In an interview with Teen Vogue, he mentioned how "at the Met, I was just a free bird and really living my best life. But prom was really stressful. I had to really sharpen up for prom." Source: Yearbook Library via E! It looks like the "Oops, I Did It Again" singer was always daddy's little girl. In a photo dug up from her high school yearbook, Britney is pictured standing right in front of her dad in a beautiful red dress that somehow looks very dated, even though it wasn't from that long ago. I wonder where one could find such intricately embroidered mermaid-type dresses like these nowadays. This photo made me do a double-take because I can't possibly imagine openly gay ex-N*SYNC singer Lance Bass ever dating Boy Meets World's Topanga, but hey, the nineties were a millennium ago. Back then, the two went to prom together, but according to Lance, the party was "terrible." "We only stayed for 20 minutes," the boy band singer told Cosmo. 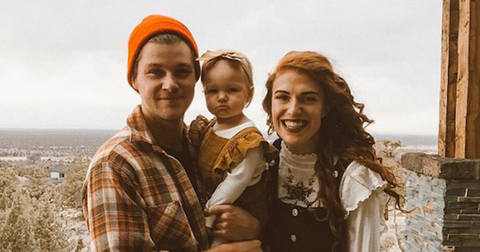 The couple dated for over a year, until Lance broke up with Danielle for no apparent reason. Before meeting her current husband, Danielle described Lance as "the one who got away." Aww. 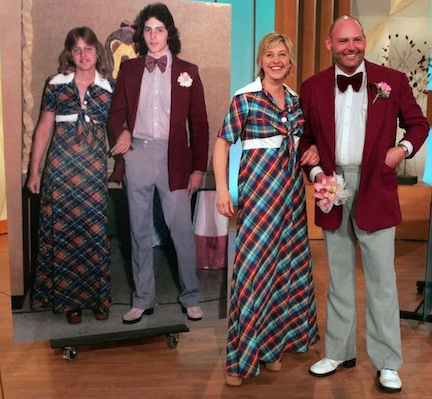 Since we're digging up the throwbacks, allow me to make your day with Ellen Degeneres' prom look, followed by a picture with her and her prom date, Richard, wearing the same outfits decades later. I'm not exactly sure how she ended up looking younger 29 years after her prom in 1976, but that's Ellen's magic. Oh and that dress. Talk about a look that only Ellen and maybe my 80-year-old grandma could pull off. 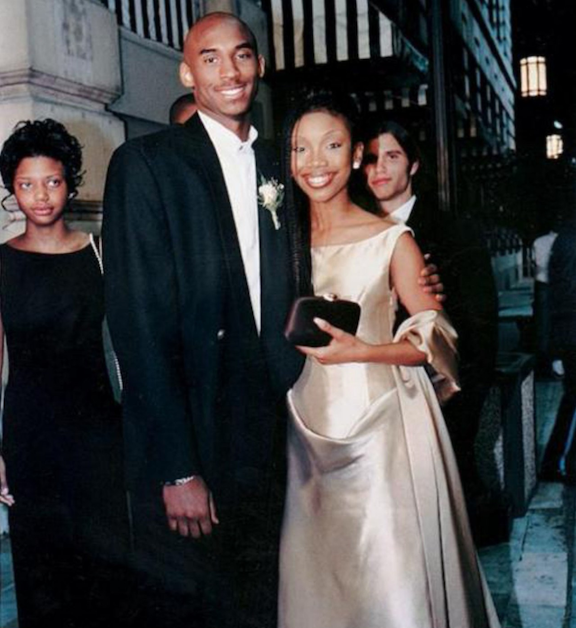 I don't know why it's hard for me to wrap my mind around the fact that celebrities could have been friends back in high school, but Kobe Bryant and Brandy were one such prom pair. After meeting at the Essence Awards back in 1996, the former Lakers player decided to take his chances asking her out to prom. Because who wouldn't want to take the "Boy Is Mine" singer as their date? Brandy didn't just accept, she also arrived looking absolutely dazzling in this champagne Moschino dress. 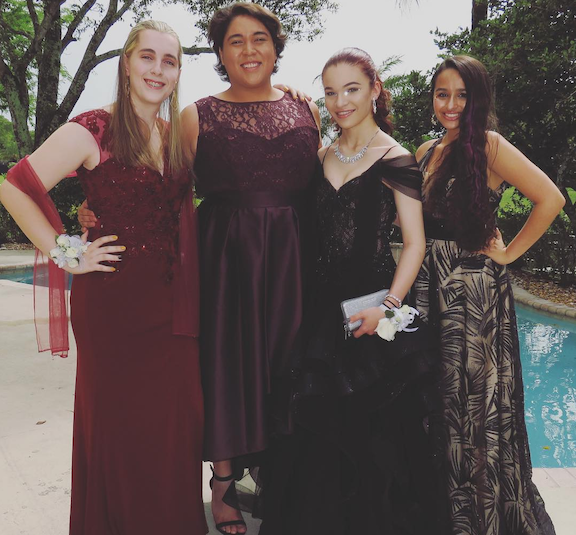 I Am Jazz star Jazz Jennings recently went to an LGBTQ+ prom with a bunch of her trans friends. In the new season of her show, viewers can watch as the group goes shopping for the perfect dresses and what goes on behind the scenes of a queer high school prom. Spoiler alert: it seems like a lot of fun, if you don't have a friend like Noelle going through a PTSD breakdown. All in all, the group looked stunning, and Jazz's mom even helped her shop for her dress via FaceTime. Adorbz! If this list has you feeling sour about your past prom look, take comfort in queen-of-the-internet Blake Lively's high school style. Thanks to Imgur user Schnecken who uncovered this priceless pic, we can now relish in the fact that she's wearing a tiara, a bedazzled pink dress, and is standing super awkwardly with her date who can't quite decide where to rest his hands for this photo. I told you celebrities were just like us.